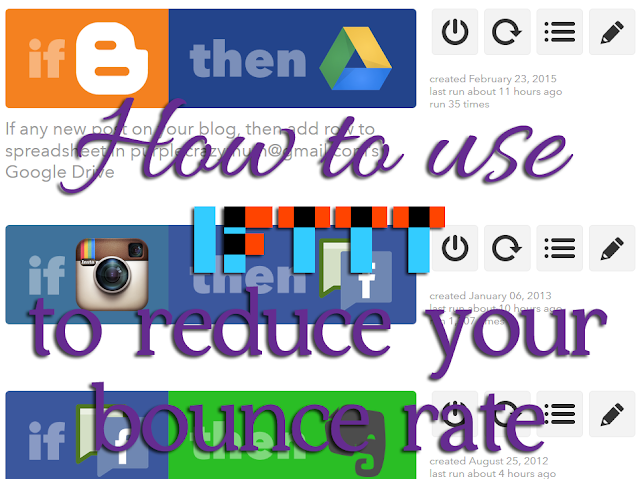 Bounce rate is the measurement of how many pages someone visits before leaving your site. Google measures bounce rate every thirty seconds, so if the reader finds what they want on the page they land on, and bounce away, that counts towards your bounce rate. My bounce rate has hovered around 78% for the whole entire life of my blog. But this month it has dropped significantly. That is, in part, because of the Every Day in May challenge. But it's also because I link to older posts. Linking to older posts keeps readers on your blog for longer. So, how can you use IFTTT? First off, if you've never heard of IFTTT before, it means IF This Then That. It's an early computer coding term. IF (this thing happens) Then (do) That (thing). It's a powerful website that can automate your online life. I've been using it for a few years, with a couple of different Recipes. IF (instagram photo) Then That (facebook page) was one of the first Recipes I set up in the days before Facebook bought Instagram. I also use IF (facebook status) Then That (Evernote notebook) to capture the cute things kids say to be immortalised in scrapbook pages. Ok, so here's how IFTTT can help reduce your bounce rate. Linking to old posts keeps people on your blog longer. Finding old posts can be hard when you've been blogging a long time. I know that searching on Blogger can be a little bit clunky sometimes, so a powerful search tool is needed. Excel is a pretty powerful tool. So is Evernote. I stumbled on a Recipe that says IF (blog post) Then That (Google Drive), meaning that all the details of the post, link, header, tags, date, are sent to a spreadsheet in Google Drive, making searching easier, and linking to old posts even easier! Have you used IFTTT before? Tomorrow's prompt what would you do with a million dollars? It's a pipe dream for many, winning the lottery. How would you spend the money if your numbers came up? I made a spot for links on my excel editorial calendar so it's easy to grab a link & add to a post or social media update. So much easier than searching your blog :) IFTTT is still going over my head right now, but I will blame baby brain now & read up some more. My bounce rate isn't great at the moment thanks to a viral post over the past month or so. I have not used this before, I will have to look into it more. Thank you for sharing. I hadn't really put a name on it, but I have become better at linking to previous posts and other pages on my blog. Just checked and my bounce rate for the last month is 57.64%. I've only checked it a few times over the years, and it seems it was always in the 70s before. Very interesting information today.